Prior to creating your wintery oasis, ensure that all decorations selected for outside display are designed for outside use. Although you may want to use indoor and outdoor lights interchangeably, they are designed to work in certain environments. For example, outside lights are able to withstand windy conditions whereas indoor lights are safety tested to prevent overloading your Christmas trees. When selecting which electrical cord is best suited for your decorating arrangement, be sure to inspect its insulation to ensure the wrapping is intact. If the protective covering becomes separated from the wires, you can run the risk of possibly causing a power shortage, starting a fire or creating a shock hazard than can cause serious injuries. 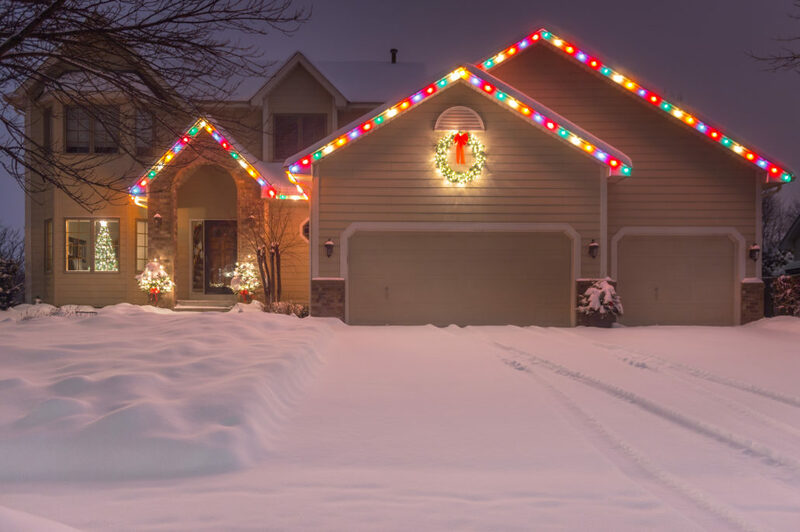 All outdoor lights and electric decorations should be plugged into circuits protected by a ground fault circuit interrupter (GFCI). The GFCI helps to thwart electrocution by monitoring the electricity flowing in an out of a circuit and will automatically turn off the power if it detects an irregularity. If you choose candles as a means of creating seasonal ambiance, be sure to keep in mind that they should never be placed near anything that can easily catch fire to include books, bedding, curtains, carpets, etc. Should your household have the tradition of using a real tree, be sure to water it daily. Dry or brittle needles combined with damaged lights can be recipe for fire. Please keep in mind that the larger the tree, the more water needed to maintain its lush appearance, fresh pine fragrance and avoid a potential fire hazard. Typically we would encourage you to recycle however, when it comes to gift wrap, simply throw it away as opposed to discarding it into your fireplace. The reason being is because, when burned, these metals can either set off unexpected sparks – similar to those of fireworks – or create airborne particulates which can expose your family to range of health risks. Inflatables and other major appliances – such as your 20’ pre-lit, outdoor snow globe – should only be plugged directly into a dedicated socket. This important step will ensure enough power is available without overloading your entire system. Relying heavily on extension cords is a clear indication that you need additional outlets. Having a qualified professional address your needs is a lot less stressful and less expensive than realizing and addressing an issue after a major catastrophe. Refrain from keeping outside and inside holiday lights on when you are not home or when you head to bed. By turning lights off, you are choosing to save energy and extend the lifespan of your decorations. Your family and friends at the Overhead Door Company of Western Kentucky wish you and yours a merry and bright holiday season and thank you again for putting your faith in us! Improving security at home may be a top priority this year. Try our Overhead Door Anywhere® Technology today for peace of mind when it comes to the largest entryway into your home. Have you ever thought about how heavy a garage door really is? Think about how you can open and close it without much effort. You can thank the torsion springs. While they are one of the most important working parts of your garage door system, they can also be one of the most dangerous. Garage door springs need regular maintenance to stay functional and safe. We’ve got you covered on things to be watching for with torsion springs.